It’s been a rather long time since I have had a moment to breathe, let alone sit down and blog. Since my last post, I have been knee deep in contract work, which has helped pay the bills but has left me burning the midnight oil on more than one occasion. Needless to say, I’m daydreaming of a vacation (le sigh). However, never fear, baking has been occurring with frequent fervor—much to my waistline’s behest. It all started, as all good ideas do, over a lovely glass (or perhaps two) of Absinthe in a café on a Friday afternoon with a friend. In between the sugar cube melting into the green, anise-flavored concoction and wild conversations about traveling, psychology and a potential business venture, my friend and I decided to bake. Perhaps it was all the talk about my past baking endeavors that made visions of cupcakes dance in his head, but either way, we created a delicious chocolate jalapeno cupcake with cherry frosting. Sadly, my camera did not come along for this sweet and spicy ride, so I have no pictures. However, I plan to make them again soon and include pictures (stay tuned). Then, a few weeks ago a friend of mine celebrated a birthday. For me, birthdays have always been a time to put on my thinking cap and come up with some creative recipes. I would much rather spend hours in the kitchen making a yummy birthday dessert than buy something that they will probably just forget about in a month. There is something about seeing someone’s face light up on the first mouthwatering bite of a dessert you slaved over that somehow means so much more than watching them open the pair of earrings you bought. Don’t get me wrong, I love earrings (and clothes…and shoes…and books…); however, baking is an art for me, and having people appreciate it just makes it seem just a little more personal and heartfelt. Plus, it gave me a chance to try out some new recipes. I adapted some of the birthday girl’s favorite desserts to create four decadent birthday cupcakes: apple pie cupcakes, red velvet cupcakes with almond frosting, cheesecake cupcakes with a chocolate ganache, and the good ole tried and true chocolate cupcake with vanilla frosting. Of course birthday baking included inviting over a friend to help with this rather large task, which quickly lead to baking with drinks (another favorite pastime). And while I didn’t capture photos with the same attentiveness as usual, this recipe will more than make up for the lack of photography. Nothing memorializes summer quite like a good apple pie. So find the closest porch swing, and grab a cold glass of lemonade and an apple pie cupcake. Just typing the name makes my mouth water. 1. Preheat the oven to 400 F and spray the muffin pan with cooking spray. * I’ve attempted this recipe twice, once with cupcake liners and once without. 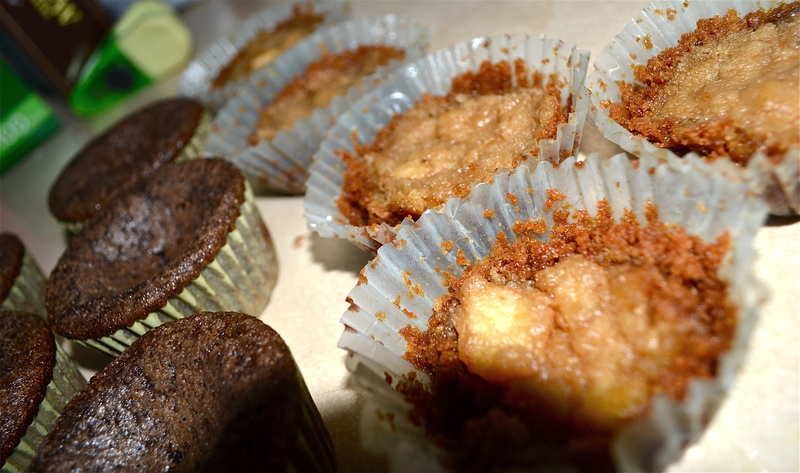 While it was definitely easier to get them out of the pans with the cupcake liners, the crust did get stuck to the paper in some spots. So I would recommend foregoing the cupcake liners and just really greasing the muffin pan. You may have to fight to get those beauties out of there once they cool, but at least you won’t be enjoying your cupcakes with a side of paper. 2. In a skillet, melt 2 TBSP of butter over medium heat. 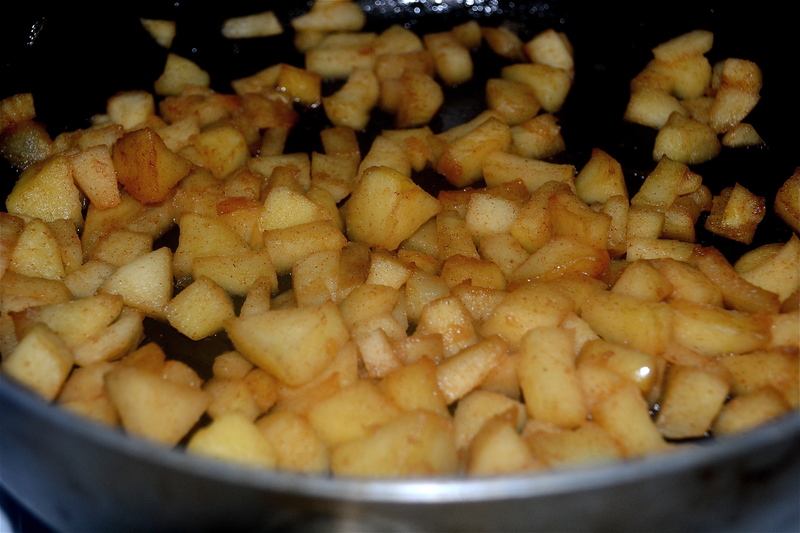 Then add the apples and cook for about 5 minutes, stirring until they soften. 3. 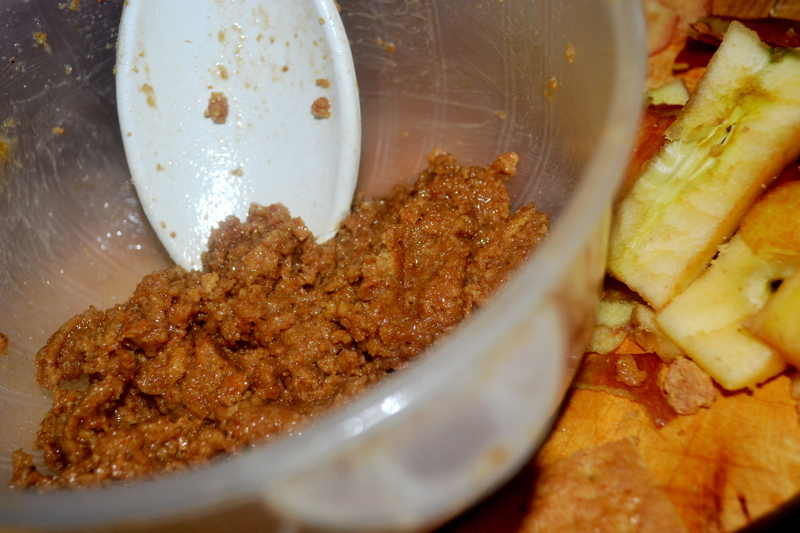 Then sprinkle 2 TBSP of brown sugar, 1/2 tsp cinnamon and 1/8 tsp salt on the apples. Then cook 5 minutes longer or until the apples are soft. Then stir in the lemon juice. 4. While the apples are cooking, start on the graham cracker crust. The beauty of the crust recipe is that it really is simple. To crumble up the graham crackers to perfect consistency, I put them in a bag and smacked the bag around a bit on the counter (did I mention that baking is also a stress reliever for me?!). Once the free anger management session is over, combine the three ingredients, knead a bit, and then fold into the muffin pans (making sure to fold the crust up at the ends so that it’s shaped like a little bowl). 5. Now to make the topping for the cupcakes. 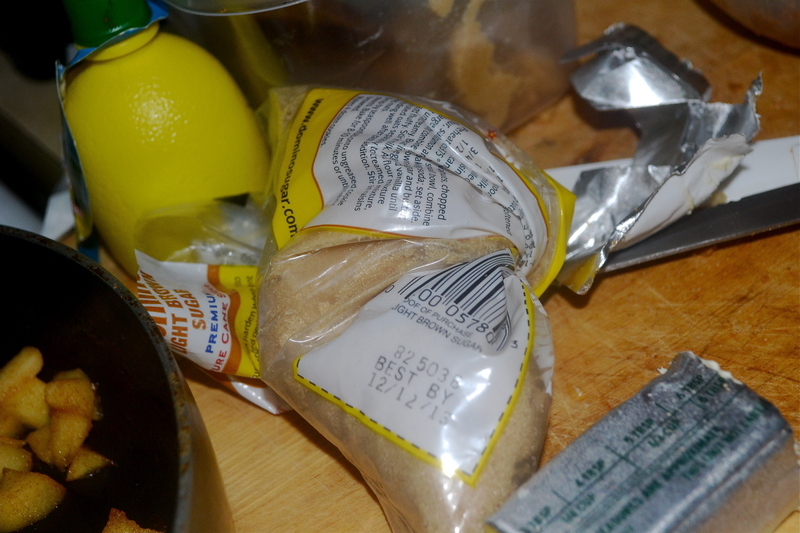 In a small bowl mix 2 TBSP butter, ¼ cup of flour and ¼ cup of brown sugar. Feel free to add more butter to the topping recipe if needed, but the consistency should be more dough-like (it should be thick enough to stretch over the apple pies and cover them completely). 6. Now add the cooked apples (which will make your kitchen smell heavenly, by the way) to the little graham cracker cups. 7. Once the apples have been added, cover each apple pie over with the topping. Much like you would for the top of a real pie, you will want to flatten and stretch this topping over the apple pies, making sure to cover them completely. 8. Put them in the oven for about 10 to 12 minutes (this will vary, depending on how many apples you used per cupcake. Mine took the full 12 minutes) until they are bubbly and the tops are a golden brown. Let them cool for a bit before removing them from the tins. If you are thinking, “Wait a minute, apple pie just isn’t the same without whipped cream”, you’re right! I happened to find this amazing whipped cream frosting recipe from Food Pusher that was beyond delicious. And what made it even better was that it was a sturdy frosting so it held up under the brutal 95-degree weather. Now I must confess, I’ve always been a cake person in the whole cake versus pie debate. However, this little cupcake almost converted me to the pie side of things. Not to mention, watching the birthday girl take a bite of this cupcake made six hours of sweating in a non-air conditioned kitchen all the more worth it. And the recipe has been such a hit that I’ve had friends requesting it. In fact, the birthday girl came over a week later and asked if we could bake more that night (and, of course, I obliged!). So while I may be a bit discombobulated by the current job transition, I have to appreciate days where I get to sit at a cozy coffee shop to do my work, where my lunch break is spent taking a mental break at the gym, and I also have to appreciate this new sense of calm and happiness that working remotely has given me. Not to mention, cappuccinos the size of my head and French music blaring from my laptop remind me that there is more to life than work. Happy Friday!